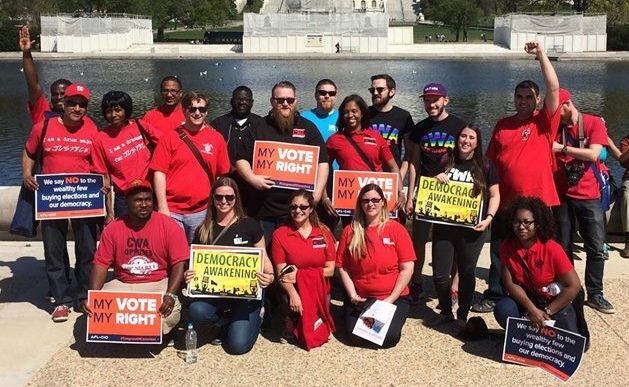 Our mission is to identify, recruit, and train young CWA members who will serve and strengthen our movement for social and economic justice through engagement in CWA’s core programs, including CWA Strong, Human Rights, Organizing, and Political Action. Since its inception in 2010, CWA Next Generation has been building networks of young members with dedicated Lead Activists in our districts and sectors. We have brought together hundreds of young members from across the country at two national summits and dozens of local, regional, and national actions to learn from each other and build our movement. Going forward, CWA Next Generation will expand our corps of Lead Activists and improve ties between national and local leaders so that we can fully integrate our program with CWA’s national goals. With support from their own locals and districts, as well as CWA national officers and staff, Lead Activists will identify and nurture young members who can contribute to key CWA initiatives. As part of our effort to integrate CWA Next Generation’s activities with other CWA programs, we will advocate for our members both locally and nationally at CWA gatherings and through a variety of communications methods. We are committed to making sure young workers have the opportunity to bring their knowledge and commitment to the forefront in CWA’s fight for economic and social justice. If you're a CWA member who is 35 or under and want to learn and lead, you belong in Next Gen. Be part of CWA's future. Join us.